Khālid ibn al-Walīd (592-642) (Arabic: خالد بن الوليد) also known as Sayf-Allah al-Maslul (the Drawn Sword of God or Sword of Allah), was one of the two famous Arab generals of the Rashidun army during the Muslim conquests of the 7th Century. The other great general was Amr ibn al-‘As. He is noted for his military prowess, commanding the forces of Muhammad and those of his immediate successors of the Rashidun Caliphate; Abu Bakr and Umar ibn al-Khattab. His greatest strategic achievements were his swift conquest of the Persian Empire and conquest of Roman Syria within three years from 633 to 636, while his greatest tactical achievements were his successful double envelopment maneuver at Walaja and his decisive victories at Ullais and Yarmouk. 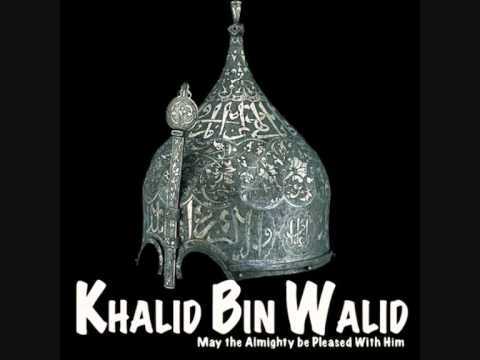 Khalid ibn Walid was from the Meccan tribe of Quraish, who opposed Muhammad, and he played a vital role in their victory at the Battle of Uhud. He accepted Islam, however, and joined Muhammad after the Treaty of Hudaybiyyah and commanded various expeditions for him, such as the Battle of Mu’tah. After Muhammad’s death, he played a key role in commanding Medinan forces for Abu Bakr in the Ridda wars, the capture of the Sassanid Arab client Kingdom of Al-Hirah, and the defeat of the Sassanid Persian forces during his conquest of the Persian Empire. He then crossed the desert to capture the Byzantine Arab client state of the Ghassanids during his conquest of Roman Syria. Even though Umar later relieved him of high command, he remained the effective leader of the forces arrayed against the Byzantines during the early stages of the Byzantine-Arab Wars. Under his command, Damascus was captured in 635 and the key Arab victory against the Roman Byzantine forces was achieved at the Battle of Yarmuk (636), which led to the conquest of the Bilad al-Sham (Levant). Khalid ibn al-Walid fought over a hundred battles in his campaigns against the numerically superior forces of the Roman Empire, Persian Empire, and their allies, and remained undefeated throughout his career, a fact that Muslims and other admirers point out when regarding him as one of the finest generals in history. His greatest strategic achievement was his swift conquest of the Persian Empire and conquest of Roman Syria all within just three years from 633 to 636. He also remained military Governor of Iraq from 632–633 AD and Governor of Qinnasrin city in Northern Syria. Much of Khalid ibn al-Walid strategical and tactical genius lies in his use of extreme methods. To him a battle was not just a neat maneuver leading to a military victory, but an action of total violence ending in the annihilation of the enemy forces, in order to account for the numerical inferiority of his own forces. The maneuver was only an instrument for bringing about the enemy’s destruction. Khalid’s greatest tactical achievement was at the Battle of Walaja, where he was the only other military commander in history, along with Hannibal at Cannae, who successfully used the double envelopment maneuveragainst a numerically superior army. His most decisive victories were at the Battle of Walaja and Battle of Yarmouk. According to a narration, he had scars of wounds from swords, lances and arrows (that he endured during his campaigns), all over his body except his face. He had so many scars that people often wondered how he survived them. Khalid and Umar the second Caliph, were cousins and had very close facial resemblance. Khalid and Caliph Umar were both very tall, Khalid had a well-built body with broad shoulders. He had a beard which appeared full and thick on his face. He was also one of the Champion wrestlers of his time.